We are super excited to build with you all this Sunday, September 4th for Black Daddies Club annual Family and Friends Picnic at Petticoat Creek Park in Pickering. It is our pleasure to announce that one our community partner’s the City of Toronto has provided two 48 seat shuttle buses to ensure that this event is accessible to community members across the Greater Toronto Area. There is a bus that will be dedicated for community members living in Toronto west, this bus will be making stops at Jane and Finch Mall and Lawrence West Mall (across from Lawrence West Subway Station). There will also be a bus dedicated for community members living in Toronto east, this bus will be making stops at Scarborough Town Center Mall, Malvern Town Center Mall, and Kingston and Galloway. 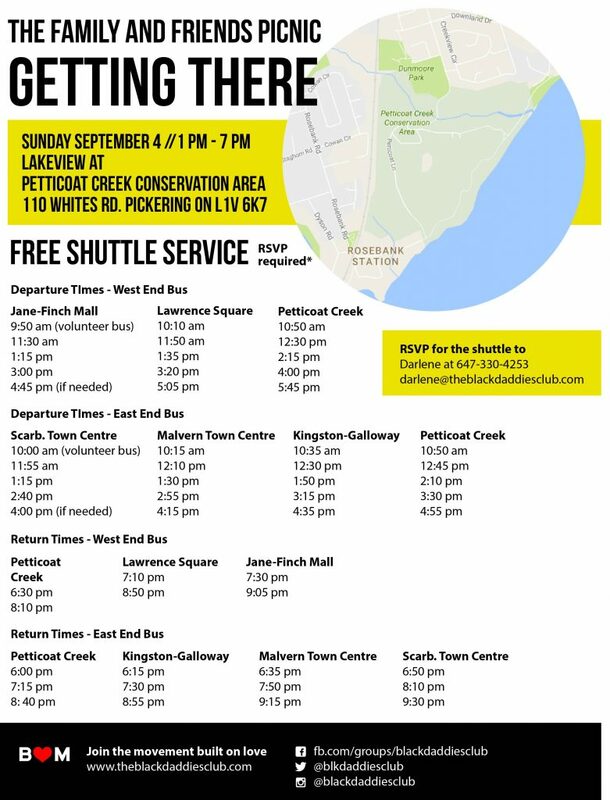 If you are interested in taking this free shuttle service it is important that you RVSP with Darlene atdarlene@theblackdaddiesclub.com before Saturday, September 3rd, 2016 so that we can ensure that everyone is able to attend the picnic. This event is a potluck, but you can also purchase food at the picnic from one of our food vendors. There is a general admission fee to get into Petticoat Creek Park due to fact it is a provincial park, non of this fee will go to Black Daddies Club, but rather to Ontario conversation, this cost is mandatory to all patrons entering the park. There is also afee to get into pool and splash pad area, children must be accompanied into this area with an adult. The theme of the picnic this year is “How can we support Black children and their parents living in the Greater Toronto Area?“, there will be a discussion taking place at the picnic as one of the many activities that will be taking place on September 4th, between 12pm to 7pm. We look forward to sharing space with you all, from grandparents to grandchildren and everyone in between.